The mission of the Dan Beard Council is to prepare more than 30,000 young people in the Greater Cincinnati and Northern Kentucky area to make ethical and moral choices over their lifetime by instilling in them the values of the Scout Oath and Law. In schools, churches and community centers, you will find the character education programs of Scouting delivered to young people. Scouting was founded on the premise of doing a Good Turn daily. Community service is very important in the character-building process and, as Scouts, we have made the commitment to give back to our communities. Last year, over 140,000 hours of community service were provided by Scouts from the Dan Beard Council, directly impacting the Greater Cincinnati & Northern Kentucky area. The Boy Scouts of America strengthens families. We believe in involving families in the training of youth, and we are sensitive to the needs of present-day families. Scouting provides opportunities for family members to work and play together, to have fun together, and to get to know each other a little better. Dan Beard Council provides fun & challenging educational programs for youth that promote character development, develops personal fitness, and builds future leaders. Last year, over 350 Scouts earned the rank of Eagle Scout, the Boy Scouts of America’s highest rank. Our Scouts earned merit badges in everything from American Business to Welding, helping them explore different career opportunities. The merit badge system is education in action. 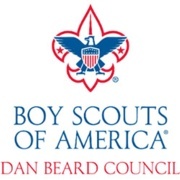 The Dan Beard Council, Boy Scouts of America reaches thousands of children annually in the hardest-to-reach neighborhoods of the Greater Cincinnati Region. Through our ScoutREACH program, we are able to deliver the Scouting program to youth residing in designated low-income and minority outreach communities. It ensures that all youth have the opportunity to participate and benefit from Scouting, regardless of their family’s income level. The generous support of the Cincinnati International Wine Festival enables The Dan Beard Council to strengthen and expand the Scouting program in our area so we can continue to make a difference in the lives of our youth members, their families and their communities.